Autonomous University of Guadalajara, Mexico. 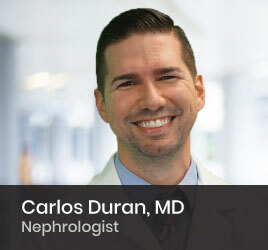 Dr. Duran specializes in the kidney, treating such ailments as hypertension (high blood pressure), kidney stones and kidney failure. For patients on renal replacement treatment he offers hemodialysis, peritoneal dialysis and evaluations for renal transplant. Backed up with 9 years experience, Dr. Duran is renowned for his dedication and commitment. In fact he has received several positive reviews from his patients, most of which have resorted to his assistance more than once.